Paul Pickhardt, who holds a Ph.D. from Dartmouth College and a bachelor's degree from the University of Wisconsin-Madison, has been a member of Lakeland's faculty since 2006 and was Lakeland's Natural Sciences Division chair from 2012-2016. A driving force behind the Lakeland Undergraduate Research Experience (LURE), Pickhardt was named Lakeland's winner of the Underkofler Excellence in Undergraduate Teaching Award in 2011. His LURE students have gone on to participate in funded graduate programs to pursue their doctorate degrees at Michigan Technological University, Rutgers University and the University of North Carolina at Chapel Hill. 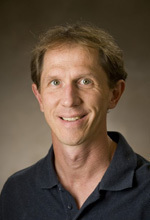 An aquatic ecologist with strong field work background, Pickhardt has published and presented extensively on this work. His area of expertise centers around the interactions of trace elements and contaminants – specifically mercury — on the biota at the base of aquatic food webs. Recent collaborations with researchers at the Oak Ridge National Laboratory investigate the potential use of polycultures of algae as biofuels. Pickhardt partnered with fellow biology faculty member Greg Smith to create Lakeland's tropical biology course in Belize. Pickhardt's dedication to environmental issues resulted in Lakeland's participation in Focus the Nation to raise awareness about climate change and a community-based ThinkHaus discussion on alternative energy. Pickhardt also serves on both the advisory and executive boards of the Ellwood H. May Environmental Park in Sheboygan.